This early image was found in the programme for the Concours Hippique (Show Jumping Event) held in Paris from 26 March to 17 April 1898. Sitting at the back of the programme was an advertisement for this Georges Richard motor car – accompanied by what we initially thought was a totally separate advertisement for a bicycle with a four-leaf clover trademark. Of course, we were wrong. As a little more research established, this symbol was the proud mark of the Georges Richard company – for both bicycles and motor cars. During the 1890s Georges Richard and his elder brother, Félix-Maxime worked together in bicycle repair and manufacturing. The business flourished, and the brothers founded Société des Cycles Georges Richard. As early as 1893 there is mention of the construction of automobiles, and expansion led them to change the company name to Société de Construction de cycles et d’Automobiles Georges Richard. In 1897 the brothers founded the company Société des Anciens Établissements Georges Richard at Ivry-Port, expressly to make motor cars. Initially these were copies of Benz cars of the time, and this Snapshot is of such a vehicle. Our advertisement publicises the winning of the light car category in the Marseille-Nice race earlier in March 1898 – so Georges Richard was clearly taking the opportunity to use his competition success to sell to the sort of people who frequented this prestigious equine event. 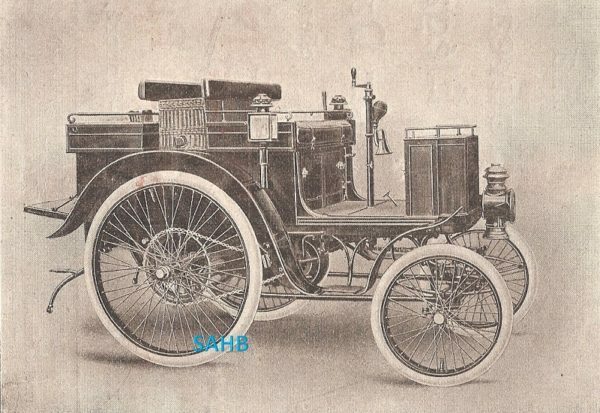 In 1900 Richard bought a licence from the Belgian Vivinus to build voiturettes, and in 1901 the brothers took on another partner, Charles-Henri Brasier. Brasier’s influence grew to the point where in 1902 the name “Georges-Richard” disappeared from the market. Instead, in 1903, cars began to emerge carrying the Richard-Brasier name. Relations between Richard and Brasier deteriorated, and in 1904 Brasier gave notice to Richard terminating the agreement between them, while purporting to retain both the factory and the four-leaf clover trademark which Richard had recently registered for the business. There followed a bitter litigation between the partners, which Richard won, but he no longer used his name on a motor car, and from 1905 all the cars were simply badged as Brasiers – still carrying the famous trademark on their radiators. In 1905, following a meeting with the entrepreneur Baron Henri de Rothschild, Georges Richard obtained sufficient funding to establish Société anonyme des automobiles UNIC, and to construct a first factory for the new company in the north-Paris suburb of Puteaux, to manufacture “unique” motor vehicles tailored to various sets of customer requirements. Initially the company manufactured only light passenger cars and taxis, but evolved into a leading French truck manufacturer.